The Republic of Mari-El is located in the east of the European part of Russia in the middle reaches of the River Volga. As a national entity it was established in November 1920. Currently it is a humble subject of the Russian Federation. 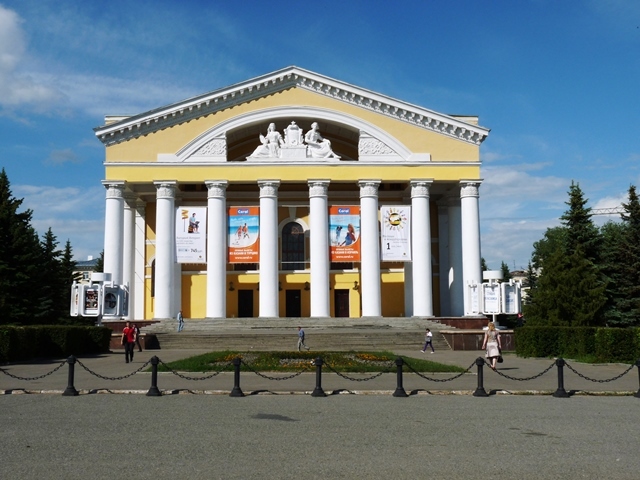 There are no outstanding historic attractions in the republic but Yoshkar-Ola the capital of Mari-El is surely worth of visiting by making a short detour on the way from Cheboksary to Kazan. The city was founded in 1584. The current president of the republic has launched a major renovation of the capital. The renovation is being carried out in the Venetian style. The major sights are located in the city center. The central square slightly resembles Piazzo San Marco in Venice. The city's clock. Every hour on the hour a donkey carries an icon from one door to another. Prince Nogotkov-Obolensky. The founder & first governor of Yoshkar-Ola. A copy of the Moscow Tsar Cannon. Saint martyr Leonid. The Bishop Of Mari-El shot by KGB during Stalin's political purges in 1938. The newly built part of Yoshkar-Ola is very colourful and photogenic especially in sunny weather. Here you can find a peculiar mix of pseudo-Russian and pseudo-Scandinavian architectural styles. 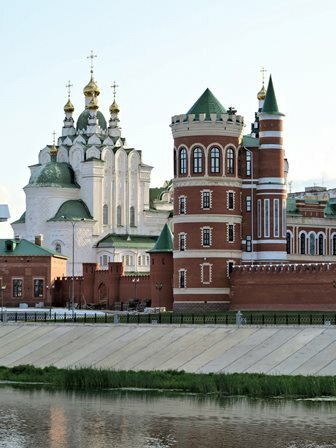 A copy of the Savior Tower of the Moscow Kremlin. Church of the Nativity of Blessed Virgin. Some postcard vistas of Yoshkar-Ola. Elizabeth I, Peter’s the Great daughter. The late patriarch of the Russian Orthodox Church Alexei II. Prince and Princess of Monaco: Rainier III & Grace Kelly. The Holy Trinity Church. Restored. The original one was commissioned in 1736. Church of the Assumption of Blessed Virgin. If you have a car and a few hours of spare time it is advisable to travel to the village of Yurino located west of Yoshkar-Ola in the direction Nizhny Novgorod. The sleepy village features an unexpectedly remarkable castle. From Yurino one can cross into the Nizhny Novgorod oblast taking a dirt forest road. Bear in mind that the road may be occasionally muddy.